Have you ever found yourself looking at a pile of your kids’ papers that had at least 437 sheets in it? You’re wondering where on Earth all of it came from! Then you realize it’s just this week’s installment of schoolwork and homework. You don’t really want to throw away the whole stack, but the idea of having to filter through that many kids’ papers is daunting! Trust me, as a mama I know how hard it is to throw away your child’s work. But, the alternative to tossing some is a house overrun with old school papers, as well as never-ending stacks of math sheets, drawings, and workbook pages. And that’s not a pretty picture. So, I’m going to say something that might stress you out, but here goes. YOU CANNOT KEEP EVERY PAPER YOUR CHILD BRINGS HOME. You need a system for deciding which kids’ papers keep and which to throw away. So, I have created a list of 10 important questions you need to ask yourself when determining what to toss and what to keep. This list will help you make a final decision that will keep mom-guilt at bay. 1. 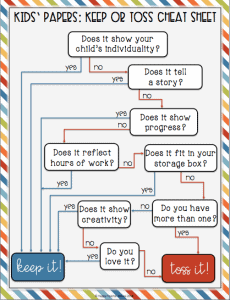 Does it show your child’s individuality? When you think about your child, is there just something about this that showcases the individuality you love? If so, it’s a keeper. If it’s just another random practice worksheet…toss it. 2. Does it tell a story? Ask yourself if the paper you’re holding tells a story. Of course, this could be a literal story, as in a piece of writing or a figurative story (i.e. a paper that is part of your child’s story of growth). If you answered yes, it’s a keeper. No means toss it. 3. Does it show your child’s progress? Is there something meaningful about this paper that shows some form of progress? Maybe it is the first high score in a subject that has been otherwise elusive. If it is a huge accomplishment for you child, you should keep it. Not so much? TOSS IT!!! 4. Does it take up a lot of space? 5. Did your child spend a lot time learning this skill? If your kids’ papers reflect a long road of learning, keep it. It just goes back to the fact that the paper tells part of your child’s educational story. On the other hand, if it is simply another worksheet with 50 definitions or multiplication problems, toss it. 6. Does this reflect hours of work? The difference between this question and the previous one is the actual product. This refers more to science projects and long-term projects that required hours of research and effort. If this is an example of a tremendous amount of work, keep it! If it isn’t feasible to keep, consider taking a picture or video as a great reminder. 7. Does it fit in your storage box? If you have no idea what I mean by a storage box, check out this post all about organizing school papers. Remember, you want to decide on a storage box and keep only what fits. DO NOT, I repeat, DO NOT get a larger box. This will defeat the entire purpose of what you’re trying to accomplish. 8. Do you have more than one of this particular type of work? If you find that your child has 3 sets of math workbook pages covering the same material, toss 2 sheets and keep 1 page. But, make sure it is a reflection of the journey or a piece of work that is meaningful in some way. Otherwise, throw out all three. 9. Does it show creativity? I’ve kept some of my boys’ worksheets simply because they had drawn an interesting picture on the back. No, I wouldn’t normally have kept them, but the drawing made it a keeper! 10. Do you just love it? If you find that some of your kids’ papers don’t really meet the criteria to keep, but you absolutely LOVE it, then put it into a separate pile. At the end of the purging session, you can go back through the items that stack. Remember, if it doesn’t fit in the storage box, you can either take a picture or throw out another piece of memorabilia. 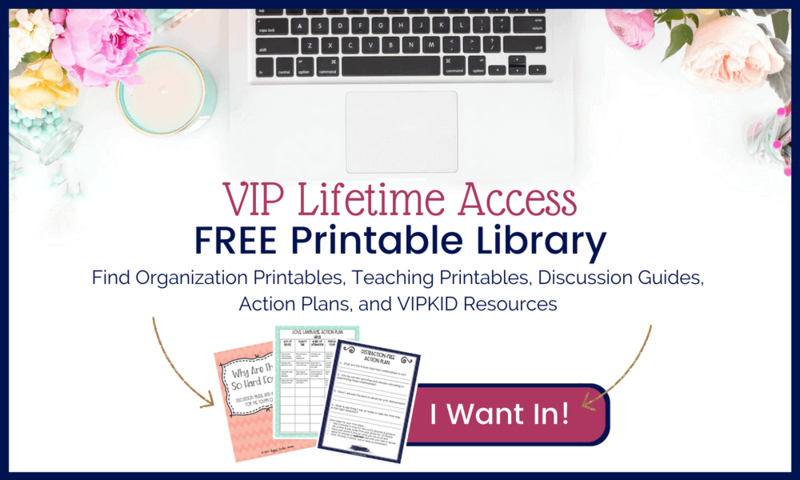 I’ve also created a FREE cheat sheet for you to download with all of these questions in a flow chart format for you to print and use whenever you need it! One last reminder for you. Get in the habit of always putting the date on your kids’ papers. This will help when you’re looking back and want to see the progression of learning throughout the year! That’s it, and you did it!! 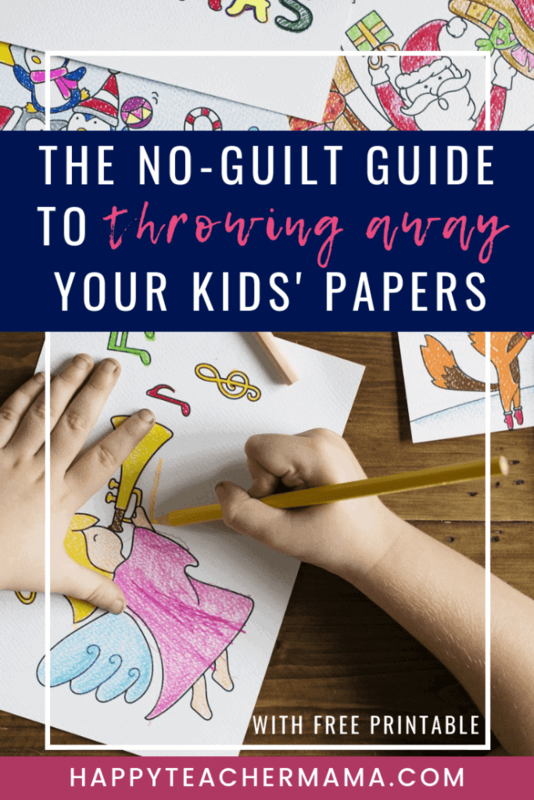 I know this isn’t easy, but I promise that you’ll be so much happier when you have a system for decluttering your kids’ papers.